Gears and Antlers Welcome to another edition of garage sale finds Friday where I share with you some of my favorite garage sale finds. This week, I want to share with you some of my latest collections, gears and antlers. Two weeks ago my cousin Erica sent me a message saying she was looking for some antlers. She told me if I found any at a garage sale to let her know. I responded and told her that I rarely see antlers and if I did, I would probably keep them for myself if I did. You see, our house seems to scream to me "lodgey craftsman style". Is that a thing? I'm going to make it a thing. One of my first purchases for the living room was Rocky. You can read more about our bear head (and the attack) here. Since then I've been trying to figure out how to decorate around Rocky. Mostly, my mantle has been bare. Get it bear?! I kill me! 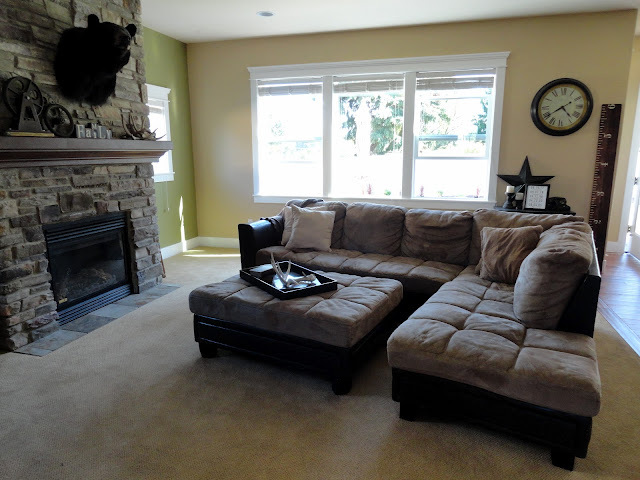 I've been trying to find a few things to add to the mantle that would compliment, not distract from a bear head hanging on the wall. Harder then you would think people. I love the way it feels when I walk into an Abercrombie and Fitch store. The grey, navy's and white plank walls are so, I don't know, homey. I figure if they could get away with a moose on their back wall, I could get away with a bear head on mine. Anyway, back to Erica and the antlers. I told Erica that I had been dying to make an antler chandelier for ages. Well, a lot harder than you would think. I couldn't find antlers anywhere. I figured they would go great with my bear head. 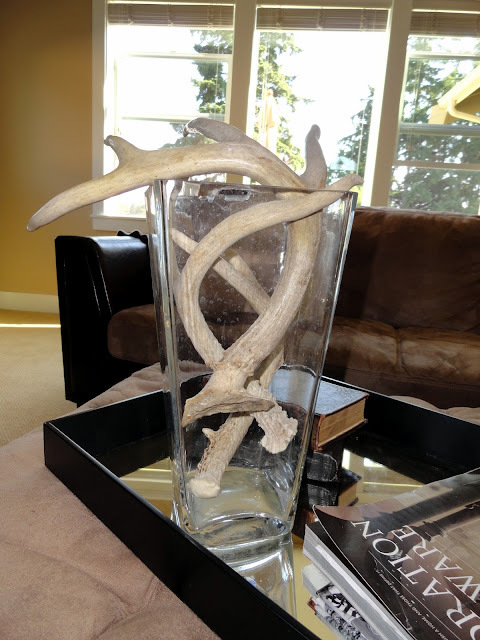 I have been looking for antlers for at least a year, so when I stumbled upon a whole garage sale full of antlers not even two days after our little e-mail exchange I was dumbfounded. Turns out the people selling all of these antlers were from Montana. Here in Washington visiting family. I immediately called Erica, but she had already found some antlers on Craigslist (doh, why didn't I think to look there???). I left the antler garage sale and didn't buy a single antler. Not because I didn't want to, but because I started to have some mental anguish. Would having a bear head AND antlers seem like too much? Would my little taxidermy addiction start a PETA intervention? I immediately turned to pinterest to see if I could find the answer to my burning dilemma. Turns out antlers are kind of a hot trend right now. I finally think I convinced myself that I HAD to have some antlers. I NEEDED some antlers. I WANTED some antlers. So the next day I headed back over to that antler garage sale hoping they still had some antlers left. 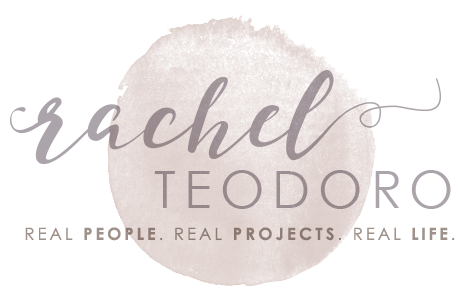 Because seriously, after all my pinterest browsing I was sure that everyone else knew something that I didn't...just how awesome antlers were, and how essential they were to modern decor. Well, my dear friend from Montana was just starting to pack up when I walked up to her garage sale. She did still have some antlers left, but the moose antlers were gone, and several of the skulls with skin and hair were still left (however, I wasn't bold enough to go there...yet! ), but she still had lots of deer antlers. I was standing there trying to decide how many I should get, when she told me that instead of the $5 each price tag, she was willing to give them to me, three antlers for $5. I was already set to pay $5 each, but with my negotiating tips in mind, I asked if she would take the four I had in my hand for $5 plus throw in a dog chew toy. Did you know dogs love to chew on antlers? I only knew that because the upscale dog store I go to sometimes has small fragments of antlers for around $15 a piece. So yep, she threw in a dog chew antler and I had in hand four deer antlers all for $5. Here's what I did with them. 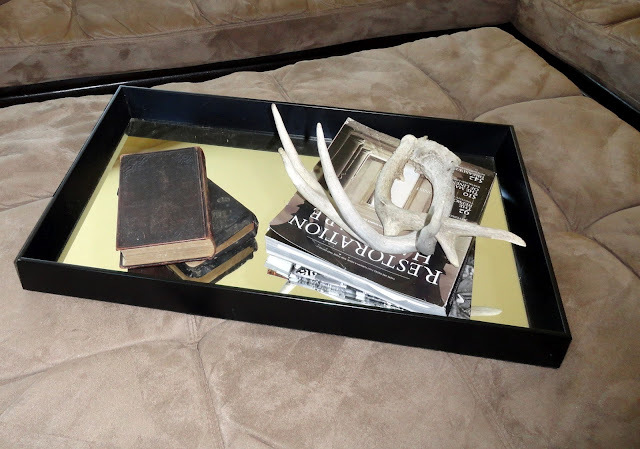 I put a few on my coffee table tray. and I put a few on my mantle in a fun tangled mess. Do you love antlers as much as I do now, or is it a bit too rustic? Do I need a PETA intervention? My next collection that I have been working on for just as much time as my antler collection (since last year's garage sale season), is my gear collection. 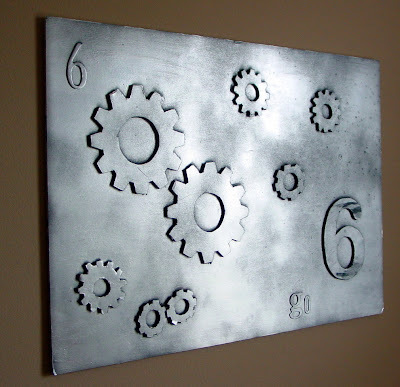 There is something about the rustic industrial look of gears that I just love. 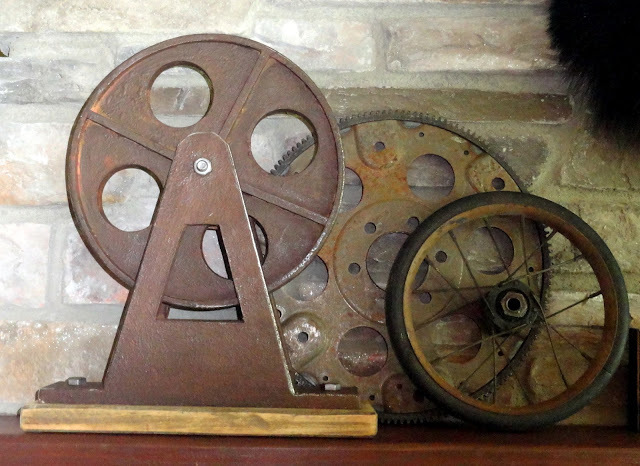 I found this large gear like shape that was mounted on some reclaimed wood at our new Home Goods store (love it! How did I ever live without one?!) and I paired it with a few of the gears I have found at garage sales. O.k. maybe one is a wheel, whatevs. I really like the three of these gears layered together, don't you? Do you have any "eclectic" collections you search for at garage sales? I like the deer antlers! I LOVE the antlers! I have some that I put in a cute metal bowl! Super cute ideas with them! Stopped by to say hi from the blog hop. Come visit me sometime the tea is cold and no shoes are required. I LOVE what you did with the antlers! I have a small rack that Sophie and I found on a walk a year ago in our neighborhood. They've been sitting in the garage because I didn't know what to do with them. Can't wait to clean them up and bring them inside, now! I love antlers. Got them in Austria last year. And what à bargain! As "hot" as antlers are now, it's great that some were left when you went back. I would have tried to cram as many as I could into my car...I am SO jealous. 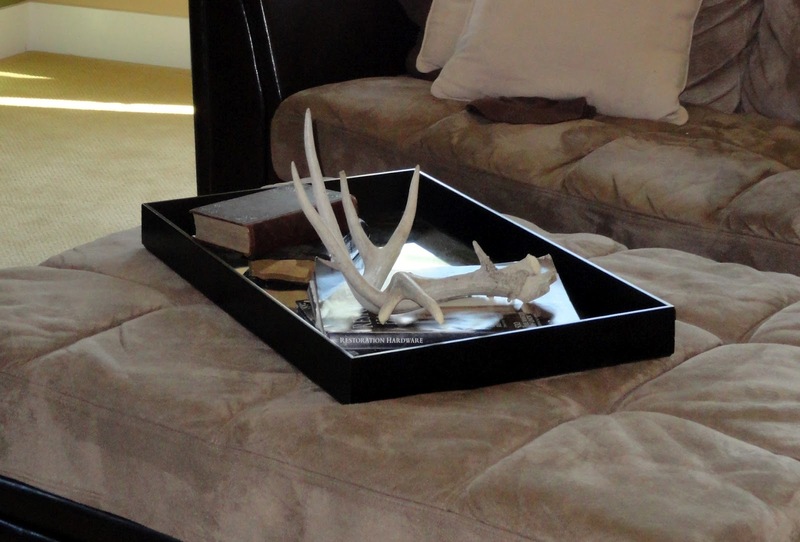 The deer antlers do look great in your house...happy decorating with them! I saw your post over at Under the Table and Dreaming. Great finds. I've rarey seen them at garage sales either but love the ideas I've seen. Maybe I'll luck out one day too. I LOVE garagesales!!!! 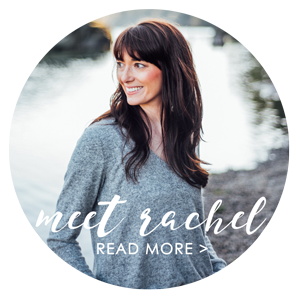 I would love to feature some of your finds over at my site! www.garagesalesrus@blogspot.com! I'm loving the antlers too these days. I especially love the idea of them for stocking holders!